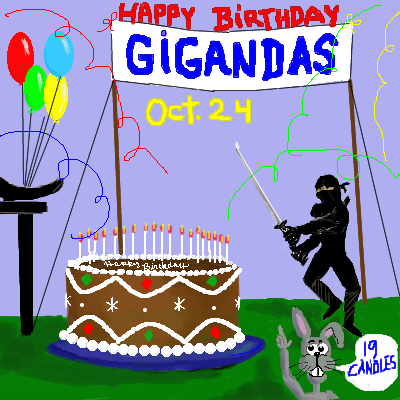 2draw.net - boards - Collaborations - Happy Birthday Gigandas!!! This cake will be cut with precision! Have a great and happy birthday Giggy! Damn, a lot of birthdays this month. Happy Birthday you. Happy birthday, man. Hope you're enjoying your freshman year. Thanks davinci & emma for the awesome drawing :).And thanks to everyone else for wishing me a happy b-day.Yeah, I just went to buy some triple chocolate cake earlier.Just hope there'll be enough to enjoy for myself with all my friends showing up tomorrow, hehe.....thanks again guys. -Didn't see Gigge's comment 'till after I posted this, so Happy Birthday to you too Gigge :).Hope you have a good one. and by cake you meant keg right??? So... Gigandas is 19?!?! wow, only one year older than me. lol Happy Birthday to you too Gigandas. wow happy birthday to a wonderful artist. can't believe anyone is that young and so awesomely talented!! woohoo!! great draw momma!